Despite family vacations and other summertime activities, 209 eager chess players still found time to play in the annual Pacific Coast Open in Agoura Hills on July 19-22. The venue in the canyons near Malibu is so remote that some GPS systems cannot locate it—one announces the destination a full quarter mile away! The weekend playing chess at the hillside Rennaissance Hotel provides a real escape from the hustle and bustle of life, especially from nearby urban Los Angeles. The writer did spot a few Harry Potter books at the tournament (Deathly Hallows was released on Saturday), but most people preferred to cast their spells on the chessboard. The tournament organized by the Continental Chess Association offered three different schedules ranging from 2-days to 4-days and seven class sections from Open to U800. In a minor twist, the cutoffs for the middle sections were based on odd numbers (U2100, U1900, etc) instead of the conventional even numbers (U2200, U2000, etc). Players who had always been used to competing in the lower half of their division (e.g. an 1850 playing in U2000) suddenly had a reasonable chance to win a prize in the odd numbered scheme (in U1900). Most of the attention focused on the strong 41 player Open section, which featured five Grandmasters and four International Masters. The titled players represented three continents besides America: GM Lars Bo Hansen of Denmark, GM Suat Atalik of Turkey and GM Rogelio Antonio of the Philippines. In fact, Hansen brought his family along for a tour of America, including his wife WIM Evgenia Hansen and son Martin Hansen (2213 USCF). However, by the end of the fourth round, it was the Los Angeles based Armenian-American GM Melik Khachiyan who had separated himself from the field in the 3-day schedule with a perfect 4-0 score. Khachiyan has a special skill for dancing with his knights, as in rounds 2 to 4 he converted three straight minor piece endgames, once with knight versus bishop and twice in knight versus knight. Apparently he likes knights so much that his opening repertoire as white consists of 1.e4, 2.Nf3, 3.Bb5 and trading his bishop on move 4, against both the Ruy Lopez (exchange variation) and the Sicilian (Rossolimo or Moscow variations). Junior Joaquin Banawa returned to tournament chess after a brief absence and matched wits with Khachiyan in the third round. After a queen trade on the previous move, black was already superior thanks to the two weak white pawns (a5 and d4) contrasted to the one weak black pawn (b7). Khachiyan obeyed the “active rooks” maxim by carefully controlling the a-file. By move 38, black was up a solid pawn and gladly traded rooks, but needed to avoid trading too many pawns (“trade pieces not pawns”) to prevent white from perhaps sacrificing one or both knights for the last pawn(s). First he optimized all of his pieces with 44… Kf7, 48… Nd6 and 50… Nd5 and maintained a solid pawn chain from f6-e5-d4. Only then did black move forward to push his opponent off the board. Position after 60...d3, where Banawa resigned. In the final position, the plausible variation 61.Ke4 Nc5+ 62.Nxc5 failed to the shot 62… d2! After all of the schedules merged in round 4, the co-leaders GM Khachiyan and GM Antonio squared off on the top board. The game began as a Caro Kann defense, thereby refuting Khachiyan’s preferred plan of playing an early Bb5. 12… Bb4 is an increasingly popular alternative to the main line of Qc7. The tactical shot 19.Nf5 allowed white to trade a knight for bishop and occupy the seventh rank. While Khachiyan maintained a comfortable space advantage after the thematic 22.d5 and 23.d6, also interesting was the more direct 22.Nh4 where Fritz confirms that the tactics work out in white’s favor: 22.Nh4 Ndxc5? 23.Qxe4! fxe4 24.Rxc7 Nb3 25.Ra2 Rxd4 26.Bf4 with an extra minor piece. Around move 30, Khachiyan reached an even material rook and knight endgame, but white’s rook and knight were both vastly superior to their black counterparts and this activity netted a pawn within a few moves. Then the tricky 37.Ne8 defended the dangerous d-pawn due to Nf6+. While the pseudo sacrifice 42.Rg8+ transposed into a knight endgame up a pawn, the tactic actually worked better on move 39 with black’s knight still stuck on the rim (e.g. 39.Rg8+! Rxg8 40.Nxg8 Nc6 41.Nxh6 c3 42.Nxf7+! Kg7 43.Ne5! c2 44.Nd3). By move 50, the game was essentially over, but Khachiyan finished it in style by sacrificing the knight with 58.Nxf7! in order to queen one of his three connected passed pawns. While Khachiyan was cruising along with four victories, the rest of the field gathered at 3-1, ready to pounce on the leader. Those with 3.0 included GMs Hansen, Atalik, Antonio and Alex Yermolinsky plus IM Enrico Sevillano and FM Joaquin Banawa. Some of the top seeds had already squared off in the first four rounds: for example, GM Atalik drew with GM Yermolinsky and IM Sevillano while GM Hansen drew with IM Sevillano and IM Andranik Matikozyan. 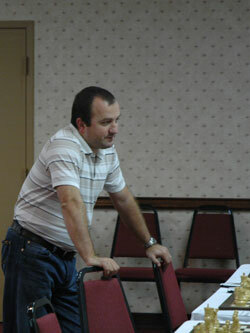 First in line to challenge the leader on Sunday morning was the top seeded Danish GM Lars Bo Hansen. In the e3 variation of the Gruenfeld, Hansen essayed the unusually passive move 7.Be2 (most people play Bc4) and then follows up with the standard central pawn push 8.e4. Instead of the natural response Nxc3, Khachiyan retreated his knight by 8… Nc7 and quickly found himself in trouble when white played 12.d5 and later 15.Rd7. With a rook on the seventh rank, white played Pacman chess and gobbled the queenside pawns. The final move 27.Rxg7 (intending a fork with 28.Bd4) left white with two bishops and an extra pawn for black’s rook. Since Khachiyan lost, the tournament was suddenly back up for grabs. Three players had 4.0 out of 5: GM Hansen, GM Khachiyan and GM Antonio. As Khachiyan had already faced both of the co-leaders, he was paired with IM Matikozyan of the 3.5 score group. The other two 4.0s took a quick draw on top board, meaning Khachiyan would take clear first with a win as white. The game began as a Rossolimo with early f4 and appeared to be heading towards a solid draw until Khachiyan uncorked a rook sacrifice out of the blue. The game would have been approximately equal if black had played the safe 23… Nxd4 24. Nxd4 Bd5 with the idea of 26… Be4. Instead, Black played 23...Nc5, possibly overlooking the spectacular 24.Re7!! when the intended 24… Qxe7 fails on account of 25.Nxf5+ winning the queen. The rest of the game was merely a king hunt, something Khachiyan executed with ruthless efficiency. This last round victory clinched sole first place for Khachiyan at 5.0 out of 6, worth about $1600. Four titled players tied for second place at half a point less: GM Hansen, GM Atalik, GM Antonio and IM Sevillano. The top honors for U2300 went to Harutyun Akopyan at 4.0, whose best result was a third round draw with GM Yermolinsky. Perhaps the biggest surprise of the tournament was the impressive performance by Gregory Young, the National Junior High School co-champion who at just 12 years old appears on the verge of becoming California’s newest master. He faced six masters through the event, defeating two, drawing with three and losing only to GM Antonio in a long game. In the following game, Gregory outplayed a master in a sharp battle with both kings exposed. To close this article, veteran Chess Life reporter Jerry Hanken wanted everyone to know that he’s alive and doing reasonably well. He even played three games in the tournament. One game made it into the scoresheet box and it even ended with a spectacular combination. Sorry Jerry, but this tactic was too good to pass up for this article. The game concluded with 22… Nf4!! 23.Qf3 Nxd3! 0-1 and white resigned because there was simply no useful way to delay the threat of capturing on f2 (with check or possibly even checkmate) using either the bishop or the queen, e.g. 24.Qxf6 gxf6 25.Nd1 Rxa1. Ouch!